Please consider this media kit your invitation to visit our uniquely scenic area with its gorgeous lakes and meandering rivers, rolling hills and lush valleys, quiet streams and awesome waterfalls, glacier-cut gorges and miles upon miles of farmlands and vineyards. The stories you will find here range from great culture to outdoor adventure, from must-see sites to award-winning wineries, from romantic views to recreational thrills, and from tales of charming villages to the beat of major cities. In fact, the best part of visiting New York’s Finger Lakes is often the journey itself—a journey filled with unexpected discoveries. Whether you drive, boat, hike, or bike, around every corner lies something you have never experienced before, just waiting for you to discover and enjoy it. A grand adventure awaits! Please contact our office at 800-530-7488 if you would like additional information about anything in these materials, if you would be interested in the possibility of a familiarization tour, or if you want to set up an interview with us. 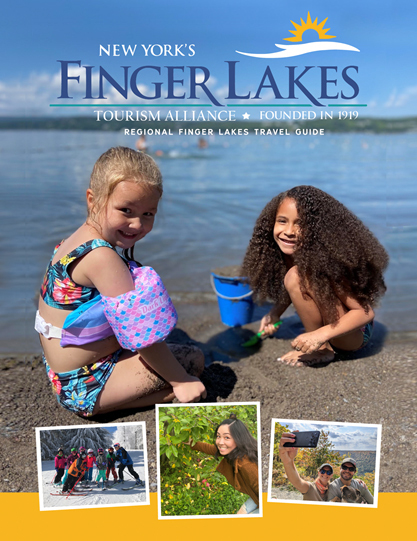 We also provide story ideas about the Finger Lakes, awards and recognition, and photographs of the region. “The Finger Lakes region in New York is a premier destination for romantic vacations.”Stephen Daniels - Travel Everywhere!